Pakistani cricketers have always managed to be in the limelight, if not for their performance on the pitch, then for their other media happenings and relationship statuses. 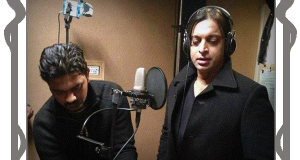 Setting a new example for the cricketers, veteran fast bowler of Pakistan, Shoaib Akhtar is now all set to launch himself as a singer to do something different from what he has been doing so far. The former cricketer will be singing a playback song for a Pakistani movie which comes under the title of ‘Saya-e-Khuda-e-Zuljalal’, which is assumed to be a patriotic movie. Adding more spice to this news, it has also been found that Rambo, Kamran Mujahid, Asjad, and the Wisdom Salad will also accompany him in recording the song. It was previously in an Indian show on Sahara Channel where Shoaib Akhtar appeared in a reality show and judged the contestants with Mahesh Bhat. His singing was much appreciated on that platform too. Let us now see how Shoaib fascinates his fans with his vocals this time. The movie will make its release by the end of 2014 possibly.